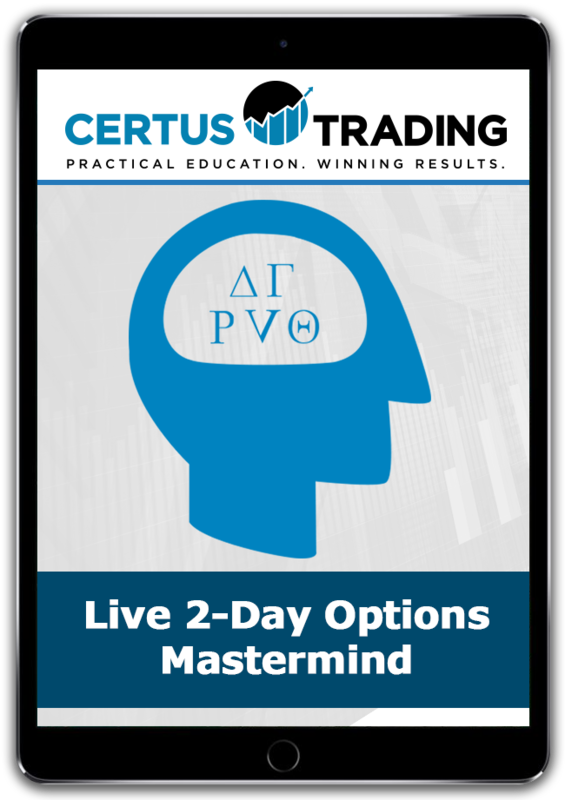 Exclusively offered to our Advanced Options Strategy Blueprint online program students, this intensive 2-Day mastermind is designed to take your options trading to the next level. At this 2-day intensive mastermind, Matt will show you exactly how he uses the 8 strategies from the program in his trading given the current market conditions, how he plans out his options trades months in advance, and even get a peak into some additional strategies that Matt uses in his trading. Different market conditions call for different strategies. Matt will cement what you’ve already learned via the online program by demonstrating LIVE the “what, why, and how” of his trade setups using strategies that are relevant to the current market conditions. Matt uses a diverse arsenal of strategies in his options trading and at this mastermind, he will share an additional advanced strategy with you that isn’t included in the AOSB online program but is one of the many he relies on to profit from the markets. The Mastermind falls in the middle of earnings season (purposely so), and Matt will be looking for Chicken Strangles and Fly2 trades real-time with you. He will take you through step-by-step exactly how he finds the best candidates focusing on trade execution. You provide the stock symbol. Your fellow traders will come up with the options strategies. Matt will be the judge of who’s got the best trade. This is the best way to learn on the fly (pun intended). Many of you love trading Bull and Bear Fly … Now imagine being able to find twice or three-times as many setups? At the Mastermind Matt will be sharing with you additional high probability techniques that you can use to profit from these two strategies. Having the right strategies is only part of trading success. Real, long-term financial success comes from having sound money management. Matt will share his money management principles that aim to build wealth and not ride the money-coaster for thrills. Forget Facebook and LinkedIn. This is networking in its pure form (how it should be!). Where else can you get a room of traders who share your passion for success? This is one of the most important parts of the 2-day Mastermind and the main reason why Matt even put this together in the first place.